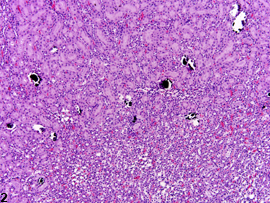 Kidney - Mineralization in a male F344 rat from an acute study. Spontaneous mineralization of cortical tubules is present. 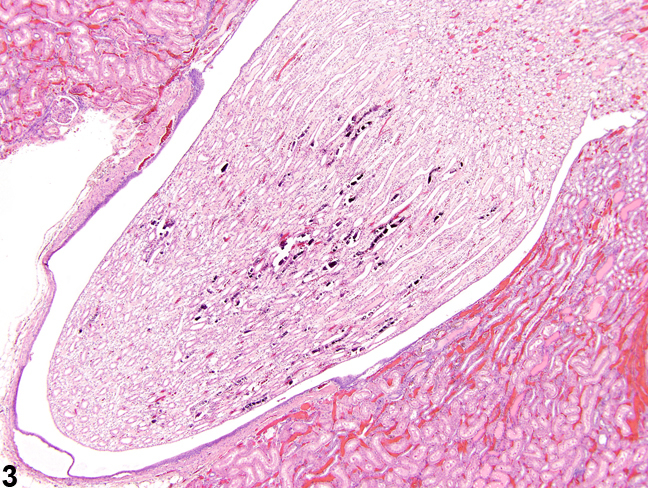 Kidney - Mineralization in a female Sprague-Dawley rat from an acute study. Mineralization is commonly observed in the area of the outer stripe and inner stripe of the outer medulla. 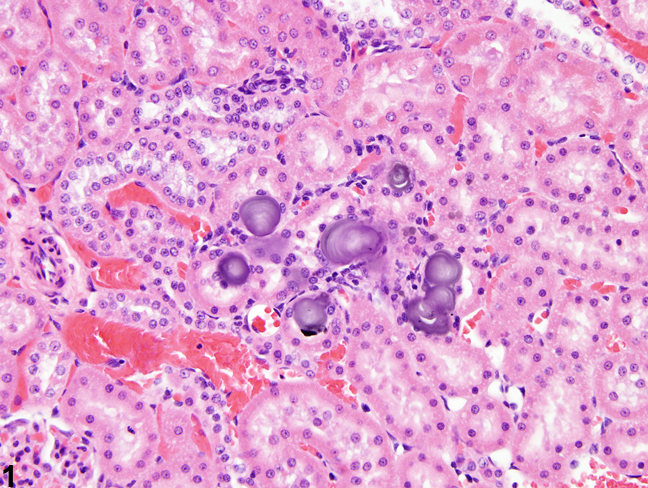 Kidney - Mineralization in a male F344/N rat from a chronic study. Linear mineralization of papillary tubules is associated with alpha-2u-globulin nephropathy. 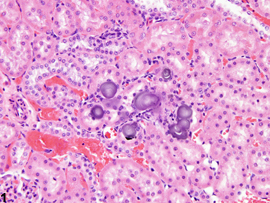 Mineralization is more commonly associated with spontaneous and minute background findings of basophilic deposits in the renal cortex, medulla,or papilla of rats and mice ( Figure 1 ). In general, these depositshave no pathologic significance. 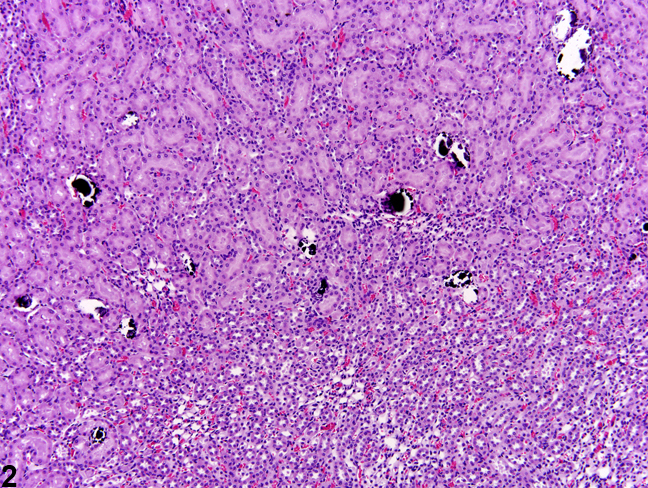 However, mineralization may also be seen as a consequence to degeneration and necrosis. Mineralization may be induced by chemicals, hormones, or diet. Mineralized deposits usually involve tubule epithelia but may also involve the interstitium. Alizarin red S or von Kossa’s special stains are used to demonstrate mineral in histologic sections. Mineralized deposits seen particularly in female rats are noted in the pars recta and thin loops of Henle near the junction of the outer stripe of the outer medulla and the inner stripe of the outer medulla ( Figure 2 ). Linear deposits of papillary mineralization are characteristic of chronic chemical administration that induces α2u-globulin nephropathy ( Figure 3 ). Artifactual mineralization is sometimes encountered in the outer cortex. The cause of this mineralization often cannot be identified. Mineralization should be diagnosed and graded. If small deposits of focal mineralization are recognized as a spontaneous background finding, they need not be diagnosed and the pathologist should use his or her judgment in deciding whether or not they are prominent enough to warrant diagnosis. When diagnosed, the pattern of the mineralization (e.g., linear papillary mineralization, focal medullary mineralization) should be described in the pathology narrative. Gopinath C, Prentice DE, Lewis DJ. 1987. Atlas of Experimental Toxicological Pathology. MTP Press, Lancaster, UK, 77-88. Ritskes-Hoitinga J, Beynen AC. 1992. 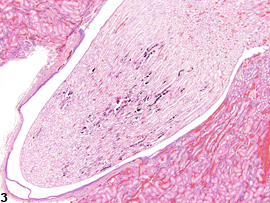 Nephrocalcinosis in the rat: A literature review. Prog Food Nutr Sci 16:85-124.